Yes, our engraving is free. Many companies charge by the character, letter or line. This tradition comes from the days when type setters had to literally "set the type." It was a time consuming task to say the least. Today computers are used to layout and "set" the type. It is a relatively simple task to format the type size, select the font and arrange it all in an appealing manner. Aren''t computers helpful (sometimes)? We use state of the art computers and software to make your engraving special. No extra charge to do this ... it is what you are already paying for! 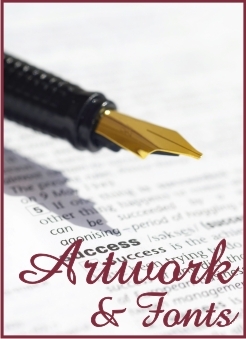 If you have your own artwork; a logo, drawing, insignia, coat of arms, etc. we can usually incorporate it into the engraving at no charge. The artwork has to be in certain formats including, but not limited to: psd, cdr, bmp, eps or jpg (If you are unsure about formats, please give us a call and we will help). If the artwork is really complicated or not good resolution, there may be a digitizing fee (This is the disclaimer to free engraving!). If you have a special font you would like us to use, need more lines or characters than we show on the order page...Call Us!! Let us see what we can do for you. We''ll use our experience for the best placement as to where the clipart may be placed. If you have questions or requests give us a call or enter a message in the Special Instructions Box. Remember, all black lines on the images below will appear white in the glass. or contact us by email..
Shop and buy with confidence! Simplicity - Ordering engraved items can be a difficult task. What font, what words, how many lines, etc!! We try to simplify the process as much as possible. Free engraving - Some companies charge for every line, some charge for every character, some charge for special fonts and logos Simply...we don''t!! It''s all included in the price of the item. Flexibility - Have a problem or special need like an extra line or you can''t quite get all the words in the inscription box when ordering? ...It''s simple...1-866-758-0655 or contact us. Affordable - We have low overhead and are able to buy many items in large quantities from our vendors so that our costs are low. Except for the Business Card Sculptures, all items are engraved right here in our shop. We do not have a brick and mortar store so you are not helping pay that overhead with your order. These savings we pass along to you. Communication - We take the time to make sure your item is what you want. Don''t be surprised if we email or call you with questions or suggestions about your engraving. And we encourage you to call or email us when you have questions. We sort of buck the trend in internet retail...We like to communicate with our customers Read what our customers are saying.